Redbird Flight Simulations announced several new product upgrades at EAA AirVenture in Oshkosh, Wisconsin, and put many of them straight to work on campus. 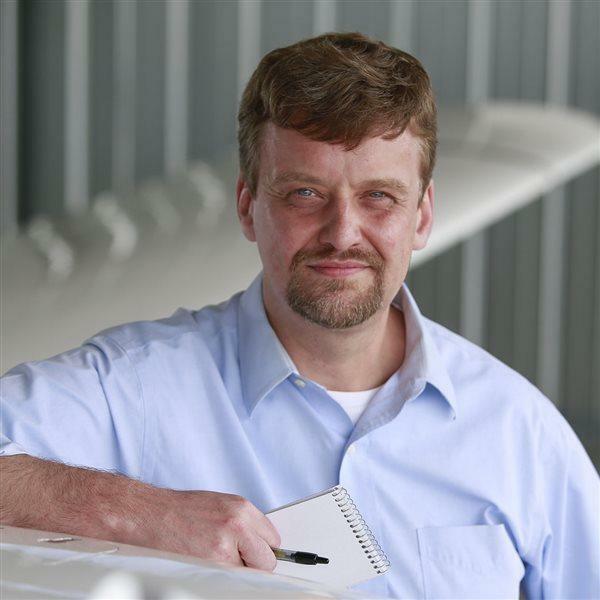 Redbird Flight Simulations Founder Jerry Gregoire speaks July 24 at the company tent at EAA AirVenture. The giant flight simulator behind him was not designed to be functional, but to start conversations. Jim Moore photo. The Texas-based company founded in 2006 to make general aviation more accessible with low-cost simulation sports a Texas-sized simulator in its AirVenture exhibit, though the massive cockpit replica (the yokes are a few feet wide) is one of few Redbird creations not made specifically to teach or maintain flying skills. The company made several announcements July 25, including upgrades to the Alloy line of flight controls for homebuilt simulators, upgrades to its motion simulator lines, and new technology to support flight training that is deployed in the EAA Pilot Proficiency Center during the show. Participants can use Redbird training devices (including 12 Redbird LD simulators, one MCX full-motion system, and a Redbird Xwind) equipped with the Sidekick data collection system and a new debriefing application, an online hub that allows users to debrief in detail and electronically log their simulation. Participants can choose from 32 flight scenarios and then visit Redbird Landing online to review and log their electronic flying. The center also will host daily technical talks on VFR and IFR topics, and those, along with simulator training, are eligible for FAA Wings credit. The EAA Pilot Proficiency Center is sponsored by several industry groups and companies, including AOPA and many others. Redbird also announced upgrades to its FAA-approved aviation training devices, including additional monitors to enhance the field of view, and an update of the Parrot communications training system that allows students and pilots to sharpen their radio skills with realistic radio calls and responses. The Scarlet system, also updated, allows instructors to control simulation sessions with simple voice commands. Redbird Founder Jerry Gregoire, addressing a crowd gathered for a reception, said the company continues to innovate, and not just in the interest of making their training devices more effective.